Enjoy fishing, boating, swimming and water sports at this charming lakefront home, or just relax with a breathtaking view of Herrington Lake from the porch swing. The home has 5 Bedrooms (3 down & 2 up), 1 Bath, Living Room, Den and a well-equipped, newly renovated Eat-in Kitchen. 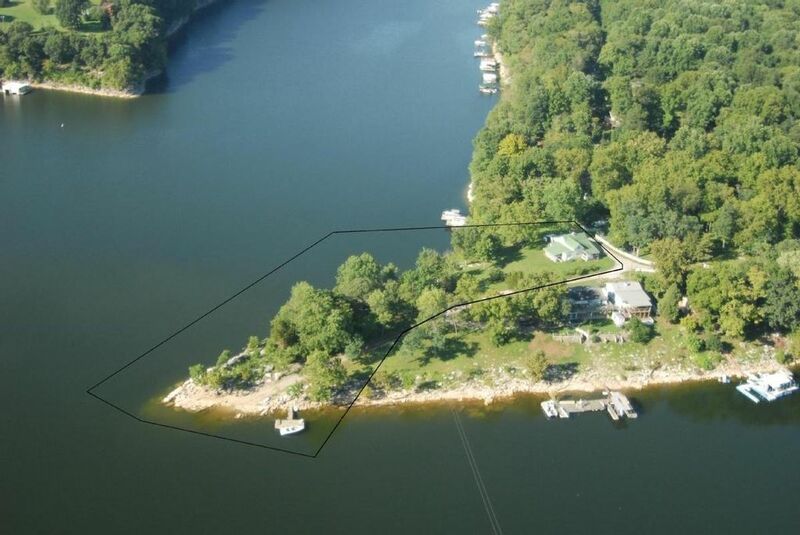 Situated on almost one acre, our home provides privacy with excellent lake access. You’ll have your own dock/swim deck with swim ladder. Very convenient to be able to launch and recover your towed boat at the semi-private boat ramp (shared with one neighbor), the ramp also makes a great place to wade out into the lake. Enjoy a camp fire on the point with the lake wrapping around you. Bring your own boat or rent a pontoon through Herrington Marina and they’ll bring it right to your dock. Access to the dock does require crossing over some rocks and irregular terrain, but can be easily managed by most people. In 2005, we planned a multi-family vacation at Haddix Point Hideaway through then owners, George & Sharon Haddix. Had so much fun, we came back the following two summers. When George and Sharon decided to sell, they offered it to us because they knew how much we loved the property. We hated to think that, if someone else bought it, they may not rent it out and we'd lose out on our favorite vacation spot! Well, with a lot of luck and some help along the way we were able to swing the purchase. We are happy to be able to share this house with so many families that return each year. Ample parking is available for larger groups. Please be sure to not park in marked septic system areas. Pontoon rental, with boat delivered to your dock through Herrington Marina. Ask owner for more details. From the back room, there is just one small step to all other areas of the first floor. There is no exterior pavement, so wheel chair use there would be difficult. On-site pontoon boat rental available or bring your own boat; private boat dock & boat ramp, fire pit, patio with table, additional lawn chairs, suitable for most elderly or infirm. Very nice place. Plenty of room. Owner, Hugh, very responsive and accommodating. Nice location with beautiful vistas. Everything you need. Five bedrooms a nice plus! We would definitely use this cottage again! Saw stars I had forgotten existed! The cabin was perfect for our extended family of six adults and three kids. The house reminded me of my grandmother’s place when I was a kid. Sleeping areas for everyone and a very nice functional kitchen. The one bathroom was the only downside, but we made it work. Swimming in the lake and the dock access were fantastic. The boat ramp was too rough and road too tight for our pontoon, but we did get the kayak in. The nice big yard allowed us to play corn hole and volleyball. We built a fire in the fire pit with plenty of driftwood and Wood found in the yard. Everything we could have wanted in a weekend getaway. Glad to hear your family enjoyed our house Sarah! Sorry to hear you weren't able to launch at our house, but best not to attempt if you don't feel comfortable. Hope you found one of the nearby marinas to get your pontoon wet! The house is fresh and clean. It has a new large kitchen for lots of guests. Unfortunately we came when the weather was auful but the view of the lake is beautiful. We will definitely come back when the weather is warmer so we can enjoy the lake. Having perfect weather for all our guest's visits is the one thing we're still trying to figure out. Maybe by next time! Thanks again for your patience with the water heater. Found the problem and getting permanent repair done today. This house is absolutely perfect! It has plenty of space inside and out! Beautiful view of the lake!! The pictures do not give it justice! I will definitely be staying here again!! One word: amazing!! Located 35 miles southeast of Lexington and 9 miles from historic Harrodsburg, Kentucky's first settlement. Local attractions include Old Fort Harrod State Park, Shaker Village, Pioneer Playhouse (summer outdoor dinner theater) and Perryville Battlefield (Civil War Museum). Also, 3 golf courses within 20 minutes! 1 hour from the Kentucky Horse Park, UK and Rupp Arena. 450 - 550/weekend 1,250 - 1,550/week Weekend (Friday 3:00 pm - Sunday noon) Week (any 7 consecutive nights) Cancellations made 60 days or longer before your rental will incur a cancellation fee of $100. Cancellations from 60 days to 30 days before the rental will incur a cancellation fee of $200. We try to be very fair, but last minute cancellations are very disruptive. This fee also applies to longer rentals that are eligible for a full refund as described below. Cancellation inside of 30 days or early departure does not warrant any refund of rent unless the unit is re-rented for that time period. We will attempt to re-rent as many of your dates as is possible at the last minute at the best possible rate based on our judgment given how last minute the cancellation is. Refunds and returns of security deposits will be processed on cleared funds within 2 weeks of cancellation. If you are concerned about having to cancel your trip, we suggest that you look into trip insurance that is available and offered by many reputable firms online and otherwise Occupancy 10 persons. $10 per day for each additional person.